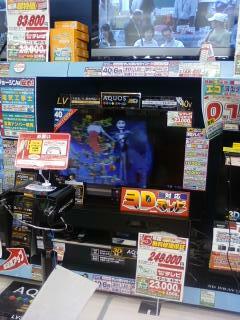 I was just at Joshin (Japanese electronics store of sorts) and saw some 3D TVs for sale. I checked out one display and used the 3D glasses...it looked crisp, but I actually couldn't tell that it was 3D. Are these things for sale already in the US, too? I would be surprised if they weren't, several 3D TV's have been available in Germany for the past few months. I think they started selling those worldwide in late spring. Ah...yeah, perhaps I'm pretty oblivious. I've HEARD of them, but didn't know if they were in the pipeline or already for sale. I guess if I go to places that sell TVs I normally don't really pay attention to what's available, but today I was a bit more leisurely. Yeah, they're here. We even sell 'em at my workplace. I tried the glasses out; it's a neat visual, but I can't imagine sitting there wearing glasses/goggles over my regular glasses for an entire show. Yeah, they're not very comfortable to wear over normal glasses. When I was in the US in March, the Sony store was selling the 52 or 60 inchers, huge and expensive.